The jaberwockiest online casino this side of the looking glass, DicelandOnline.com, is re-born with a whimsical Alice in Wonderland theme. Diceland Online looks and feels like no other, and is designed to appeal to a growing niche market of new-generation players looking for a little more wow and a lot more fun. Following the opening of Alice in Wonderland, Tim Burton’s jaw-dropping vision of the Lewis Carroll classic in movie theatres across the world, DicelandOnline.com is launching with favorite casino games including Blackjack, Roulette, Keno, Video Slots, Classic Slots, Video Poker and more. Hosted by its own animated Alice, the casino offers exciting progressive jackpots, a slew of special promotions and bonuses, and table limits for every bankroll. Despite the cartoon Cheshire Cats and Mad Hatters, DicelandOnline.com is a full-service online casino with special incentives like the $9999 Welcome Bonus to appeal to high rolling hatters and hares. It provides a 100% bonus up to $1000 on each of the first ten deposits. There will be specialty bonuses where players will compete for vacations, vehicles, electronics and more. For deposits made using Neteller or Moneybookers there is a special 250% match bonus up to $2000. 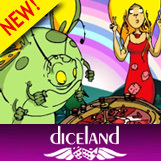 The colorful Wonderland graphics throughout the site are just part of a total re-creation of the DicelandOnline.com brand.